Early in August 1937, a news flash came: a sea monster had been spotted lurking off the shore of Nantucket Island. Historically, the Massachusetts island had served as port for whaling ships. Eyewitnesses swore this wasn’t a whale, but some new, fearsome creature. As eyewitness account piled up, newspaper stories of the sea monster spread quickly. Across the nation, people shivered in fear. Then, footprints were found on a Nantucket beach. Photographs were sent to prominent biologists for their opinion. Discussion swirled about raising a hunting party. On August 18, news spread across the island: the sea monster had been captured. Islanders ran to the beach and couldn’t believe their eyes. This nonfiction picture book is a perfect tool to discuss non-political fake news stories. Back matter discusses the freedom of the press guaranteed by the First Amendment to the U.S. Constitution. Quotes from Thomas Jefferson make it clear that fake news has always been one of the costs of a free press. A Timeline lists actual events in the order they occurred. A vocabulary list defines relevant words. 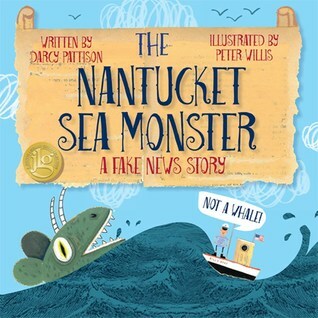 The Nantucket Sea Monster: A Fake News Story by Darcy Pattison is a great story for children. It teaches them to not believe everything the read. Just because the newspaper prints a story does not mean it’s true. Newspapers can decide which stories they want to print for their audiences and which ones they do not want to print. Things such as hoaxes, free press, and publicity stunts can be seen and used for a great story. No real Sea monster existed yet it gained so much attention. This same thing can be applied to books, social media, and websites. Not everything published is accurate nor true. Be careful what you read. This book teaches children about fake news. How it happens, how it is used, and that things like a newspaper have that right. I thought it was entertaining, colorful, and informative.